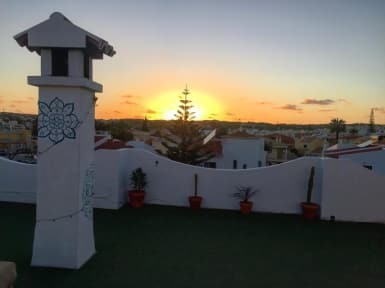 Bura Surfhouse i Lagos, Portugal: Reservér nu! Full payment is due 4 weeks prior to arrival and no refunds will be given after that date. Credit card details are retained by the management to charge for any damages. We’re located a little further out of town because we’re not just a bed; our Surfhouse is a family style villa complete with pool, in-house chef, rooftop terrace, and poolside bar. We offer the comforts of a home, but still within walking distance from the town centre, the beaches, and the nightlife. The hostel has an open-plan layout with tons of natural light, a spacious and fully equipped kitchen, plenty of outdoor seating, deck chairs for tanning by the pool, hammocks for lazy days, and a wraparound balcony perfect for breakfast in the morning sun. Travelling alone? No big deal, you can easily meet like-minded travellers by joining us for our famous family style dinners prepared by our chef each evening, or by grabbing a beer at our poolside bar for only €1. You’ll be part of the Bura family from the get go - we offer a free welcome drink upon arrival. We update our activities board weekly which details daily events and local tips on things to do, drink and eat in Lagos. Join us each night as we walk together into town for a thorough tour of the bars - just one of our professional responsibilities! Not a night owl? No worries; our quiet location allows guests looking for a good night’s sleep to escape the hustle and bustle of town. We are a fun hostel, but not a ‘party’ hostel, so please bear that in mind when booking with us. We can organise surf lessons, surf trips, yoga classes, stand up paddleboarding, kayaking, wake-boarding, wine-tasting to our local vineyard, and a whole range of other activities through our 24 hour reception. - Please note at Bura Surfhouse we have a strict over 18 policy. - We have a lovely dog at the hostel, so please take this into consideration if you have any pet allergies. - Breakfast - with freshly made pancakes!